Woohoooo...it's the weekend....shame about the nasty weather and we have had a dusting of snow already...but at least no work for two days...! 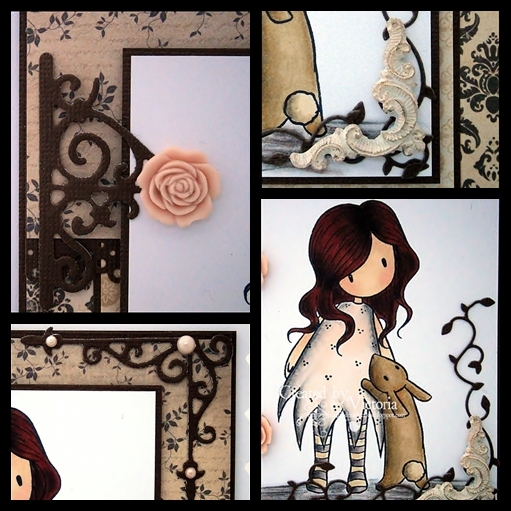 So straight onto my card...and I have used a Gorjuss Girl from My Crafty Heart on line shop. I have teamed this sweetie with some Kaisercraft "Vintage Timeless" papers, some lovely vintage corner embellies from Melissa Frances...and my new Memory Box die "Ivy Tendrils"
Border Punch ~ MS "Vintage Lace"
So don't forget to pop over to MCH...loads of gorgeous yummy and check out Teresa beautiful resin flowers..they are absolutely divine...and such pretty colours too.. So that's all from me today..off out to do the last of the shopping for Bexx's school trip..and I bet it's going to be rather cold there in NY too..and she is staying near Central Park ..can you tell I'm a tad jealous...lol...! Anyway....have a super day..and I'll catch ya all laters..
Oh! WOW Vicky, this is so amazing hun. LOVE your stunning colouring and those papers and embellies are sooooo gorgeous. Love it! Have fun shopping, ooh! New York, Bexx will have a fab time, wish I was going. Totally gorjuss Vicky. Love the colours and the colouring. Love you lo - another beauty. It would be perfect for the Colour Create challenge this time round. I love your card!! Great colours. Her hair colour is wonderful! How lovely to go to New York! Great colour combo and scrummy details. Wow this is gorgeous Vicky! Love the embellish and papers. Gorgeous card Vicky, love the lush papers and gorgeous image, beautiful colouring and details. So adorable vicky, love the muted colours! Hope you aren't effected by the snow too badly honey! We are expecting down here in East Sussex tonite! So sweet card! Love this stamp, think I need to add her to my collection♥ Have a sweet weekend!! Simply gorgeous, I love the image it is so lovely, the rabbit is so cute. Wow this is absolutely gorgeous Vicky,she's so cute, fantastic colouring and love those papers...Hope you are having a great weekend. Simply gorgeous, I love the image it is so lovely, the rabbit is so cute and fabolous colours hun! Oh WOWZERS Vicky this is stunning. Love love love the ornate corners. Totally Gorjuss Vicky, fabulous papers and love that image! Beautiful Vicky love the image and layout! Superb colouring, great papers and classy image. Gorgeous card. I love the image and colours. Beautiful card Vicky. Those papers are so yummy too. Vicky - you make some of the prettiest cards I have ever seen. You are oh major talent!! Hi Vicky, you really are on a roll aren't you! Another wonderful card, love the image and the papers are just totally wonderful. We've got the snow falling here as I type (21:48!) expected to fall until the early hours - Em is going to love it in the morning! Don't know that I will tho - not really a cold weather person!!!! We've got Freezing Rain here in Warrington...delightful lol. Oh this is Absolutely Gorgeous!!! Love the Gorjuss image, the dps, the colour scheme is beautiful. Love the layout and the embellishments. Coloured to perfection as always. Gorgeous card Vicky, I love the papers and all the swirls. Love the embellishments Vicky and the little pink roses are sweet! This is sooooooooo gorgeous sweetie loving the image & I am really REALLY needing those papers so you know where I'm going next dont you lol. I havnt used my Ivy die yet, I know I'm shocking hun. Make sure you have a really large suitcase for Bexx hun one that I could fit into lol. Oh WOW Vicky, this is stunning! A beautiful image and DP's to match, perfecto! Stunning card Vicky! Love these gorgeous papers. beautiful cards..I have been reading your blog and checkin out your cards they are all beautiful..I am now a follower! If you get a chance there is a blog hop going on over at my blog. Stunning hun, love those papers & the flowers are perfect! Love your creation, it's stunning!